The history of this baccarat variation is very interesting indeed: it was born in England and was considered to be the English game first; but it developed and received its modern characteristics thanks to the French who played it together with Chemin de Fer and made it to be rather popular in such a way. 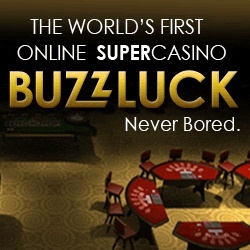 Today, Baccarat en Banque is possible to find whether in Europe or online; American casinos do not provide their visitors with this variation of baccarat card game. Remember that Baccarat en Banque has a row of differences in rules which should be learnt in order not to mix this game up with other baccarat variations. Baccarat en Banque is played at the special table which differs a bit from a traditional baccarat table: this table consists of 2 semi-circles, where only 10 maximum players can sit: 5 players for one semi-circle of the table. Unlike Chemin de Fer, Baccarat en Banque does not allow a gambler to play the role of a banker: only a casino employee can do that. If a player wants to be a banker s/he should place a bet on Banker, and if s/he wins - s/he will be a banker for the next round or till the time other player decides to try him/herself in this role. 1. 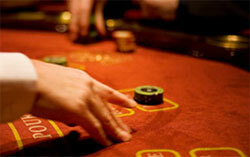 Baccarat en Banque is played with 3 decks of cards, not with 6 or 8 ones as a traditional baccarat is usually played. 2. The limit of bets is determined by a casino: if, for example, the fund is $500 and two players have made the bets of $250 dollars each - other players have no right to bet anymore because the fund is empty. 3. As for the rule of the third card, it is the following: a banker does as s/he wishes (s/he is welcome to decide whether to take the third card or not); a player takes the 3rd card if s/he has initial 0-4 points (if s/he has 5 points - it is up to him/her whether to take a card). 8-9 points determine a winner at once!